One rules variation I have been considering recently is replacing hit points with conditions. This is by no means an innovation, as many games have used conditions to manage character health or similar concepts, notably Apocalypse World, Burning Wheel, and probably several obscure RPGs from the 80s that I have not heard of. The goal of such condition-based systems is often to avoid hit point inflation or decrease the abstraction inherent in hit points. The major obstacle for me in using a condition-based system is that it becomes hard to differentiate between major and minor harms, unlike with hit points where such outcomes can easily be modeled by the quantified differences between something like a die of damage and a single point of damage. Additionally, hit point systems are more familiar to tabletop gamers, and learning a new approach requires effort. I was considering three major conditions: demoralized, wounded, and dead, giving player characters two free hits before going down. When a character suffers major harm, the player must choose one unmarked condition to mark. I imagine the general order would be demoralized first, followed by wounded, and then dead. For minor harms, I was considering recording hash marks over the major conditions, with six such hash marks leading to suffering the major harm indicated. I expect that minor harm would not generally accumulate enough to trigger suffering major harm given how I have seen RPG sessions play out, but minor harm could nonetheless provide some weight to otherwise meaningless tradeoffs (such as exploring the wilderness without having food to eat). However, I wonder whether the complexity of this system is worth requiring players to confront an unfamiliar system. 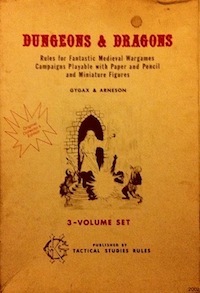 Additionally, three named conditions do not generalize to non-player characters or monsters very well, requiring referees to track a variable number of hits for some opponents anyways. My current version of this approach has inflicting harm being implemented by marking a hit on the opponent, which essentially lets hit points in by the back door. This post might read as if, on reflection, I am leaning against this new approach in favor of just implementing some more traditional hit point system. However, I think the numerical approach of hit points does make players more likely to reason quantitatively about character capabilities rather than think creatively about problem solving. Further, there is a suggestive element of demoralization or taking a wound that seems valuable beyond suffering 1d6 damage, even if there are no direct mechanical consequences (though there could always be diegetic consequences, such as trying to bluff in a negotiation with an opponent while nursing a wound recently acquired). This entry was posted in Rules and tagged combat on July 4, 2016 by Necropraxis. If you don’t want to move it too far away from traditional hp (so that like you said, it stays relevant to monsters and isn’t too hard to explain to players), could you maybe just apply the conditions on a scale to traditional hp? As in maybe when you lose 1/3 of your total hp you’re Demoralised, when you’ve lost 2/3 you’re Wounded, when there’s no more hp you’re Dead. Then taking hp damage is kind of the same as marking down Minor Harms, counting down to the next condition, and taking a Major Harm (whatever the requirements for that might be, maybe just a Crit?) drops you straight to the next condition. How well that would work is entirely dependent on how many hp are common in your game of course, I mean it’s not going to make much sense if most characters cap out at 8hp or something. I agree with Logan. Instead of replacing HP with “minor harms,” it seems reasonable (and has a lot of precedent, including D&D 4E’s “bloodied” mechanic) to find a way to divide up HP and assign conditions to various HP ranges. The downsides are that this will inevitably call for some annoying rounding while still allowing players to calculate their strategy based on numbers. The upside is that it allows for conditions to be assigned in a consistent way without significant new rules to deal with. And as long as we’re speculating here, I see potential for throwing specialized rules into the mix. Maybe berserkers gain bonuses instead of penalties as their condition worsens, but they pay for it as soon as the rush wears off. Maybe greenhorn characters, or characters with non-combat classes, suffer a penalty from being “blooded” that hardened fighters don’t see until they’re “hurt” or worse. Maybe morale checks are called for when NPCs change condition levels. This is also where you’d presumably throw in some of the consequences of injury discussed in the post: asking for help from an altruist while “wounded” would give a bonus, but negotiating with someone who values strength would give a penalty. I don’t think of the proposed system as replacing HP with minor harms. Actually, I suspect that player characters would rarely suffer minor harms in practice as I see them as mostly resulting from resource depletion that players with proper planning to avoid. This is similar to how I rarely ever need to enforce encumbrance penalties as players tend to just keep their gear below the penalty threshold if you are using a system that is easy to administer. The potential penalty (or minor harm) still needs to exist for the rules to have weight, but it need rarely activate. The way I see this working in combat is that an outcome that would result in suffering damage in traditional D&D would instead result in marking a full condition. This does decrease the variability of outcomes that could result from an opponent’s successful attack, but that does not really bother me since I am so used to the flat 1d6 damage from OD&D. If I did use a condition system, I would want the condition to be the first order object, something that you would always need to think about front and center in play, not something that would require a calculation and be easy to forget. I found bloodied to function in a secondary way when I played 4E as it was easy to forget in practice. I do like the idea of specialized rules, but I would go further and say that you probably need such specialized rules to make players (including the referee) care enough about conditions to remember when they activate if they are derived from HP and secondary. Another example I just thought of: being demoralized grants bonuses to sneaking. I actually like including a condition that is not directly physical because it highlights some degree of abstraction in setbacks. It is not really necessary to the system though. Blooded, hurt, wounded, and dying would work just as well mechanically. Yeah I think deriving conditions from HP would be hard to apply to first level traditional D&D characters. As I wrote in response to Confanity, I also think the strength of a condition system would come from making conditions, rather than hit points, the first level game construct and it probably would work better to go all in either for hit points or for conditions if the most usable system is the goal. That said, it might be worth play testing to see if I could make hanging conditions off HP stick in actual play or if people end up neglecting it in the moment. For Apocalypse World hacks, Uncharted Worlds does injuries the best IMO: you get 5 injury slots (minor, major, severe, critical). If you already have an injury, it goes one slot up. After critical you die. Why six hash marks? Wouldn’t five be more intuitive, since that’s traditionally how we cluster them? No particular reason for 6, I just like the number. 5 would work just as well. I do often, but I had missed that post. Thanks for the link. That approach looks fun and I like the draw without replacement method, though it seems like each player character would need a dedicated bag of tokens? No, the idea is that there is a single bag of tokens for everyone in the conflict, so every time anyone is hit, the chance of the instant death counter being drawn goes up. And character’s can die in other ways; they can safely hold only 2 + Constitution modifier tokens (given old school stats, assume 2-3 in most cases), and any hit beyond that kills them as well. And once dead by any means, tokens go back into the pool. I guess if you have really huge combats you might need more than 20 tokens, but I think for most fights it would work. Though I’m not sure if it works well with scale. If you assume human-sized combatants, it makes sense, but as soon as one side or the other is much bigger or smaller I think it breaks down a bit, since you should not have a 1-in-20 chance to one-shot a dragon. Nor should a pixie have similar chances to take out a human. Good point about dragons & pixies, Travis. If I ever finish the system off to be fully usable I’d do something to the effect of “this isn’t even my final form”. So, the dragon, when drawing a Kill token, will take off and fly around shooting fireballs or maybe it gets wounded and starts thrashing about desperately, becoming more dangerous, and so on. Means big monster entries would need a unique series of stages, which sounds like a fun thing to make.